Seasonal Occurrence: Abundant mid-October through early April. Profile by Gislaine Peters: The Yellow-rumped Warbler is fairly large for a warbler and is about the size of a Black-capped Chickadee. They have a large head, sturdy bill and a long, narrow tail. In the summer, both male and females are gray with some white in the wings and yellow on the face, sides, and rump. The males are shaded while the females are more dull and may even have some brown. Currently, during the winter, both sexes are a paler brown with a bright yellow rump and some yellow on the sides. There are two distinct subspecies of the Yellow-rumped Warbler: the Myrtle Warbler, which can be found in the eastern US and Canada’s boreal forest, and the Audubon’s Warbler, which is found in the western US in the more mountainous regions. One difference between these two subspecies is that the Audubon’s throat is yellow, while the Myrtle’s throat is white. The wings of the male Audubon’s Warbler is more white than that of the Myrtle Warbler. The female Audubon’s also lacks the dark ear patch that can be found on the Myrtle. Where the two subspecies’ breeding ranges overlap, like the Canadian Rockies, intermediate forms can occur. In Summer, Yellow-rumped Warblers can be found in open coniferous forests and edges and sometimes deciduous forests. In the wall and winter they prefer open woods and shrubby habitats like coastal vegetation, parks and residential areas. The diet mainly consists of insects and berries. In the winter, because they can digest the wax in berries, they can eat berries of bayberry, juniper, wax myrtle and poison ivy. When summer comes and courtship begins the male will accompany the female everywhere, calling as he fluffs up his side feathers and raises his wings and colorful crown feathers. The pair will place their nest approximately 4-50’ above ground on a horizontal branch away from the trunk of a conifer. Sometimes nest can be found in a deciduous tree or in a fork where a branch meets a trunk. The nest is built by the female and is an open cup made of bark fibers, weeds, twigs and roots. It is lined with hair and feathers and is curved over so that it partly covers the eggs. The female will lay between 4-5 eggs and will usually be the one incubating them. The young will hatch at around 12-13 days and be fed by both adults. They leave the nest at 10-12 days and can usually fly short distances 2-3 days later. Yellow-rumped Warblers winter across much of the central and southeastern United States and High Island is no exception! 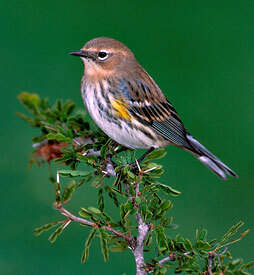 Many Yellow-rumped Warblers can be found in small groups throughout our sanctuaries. Come on out and try to find them as they flutter from tree to tree as they forage!